Click on a issue title below to view full digital edition (will open in a new window). Members and non-member subscribers must log on with their Subscription Number or RINA Membership Number (include any leading zero's) to view the issue. 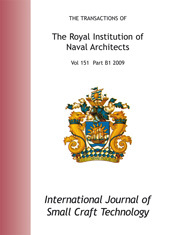 Click on the individual paper IJSCT number to see more information on the paper i.e. authors, abstract, DOI number, etc. IJSCT 133: Systematic assessment of planing sailboat hulls on a laptop computer using parametric modelling, CFD, and historical data.